If you are planning to buy new pots and pans, you may wonder who makes the best cookware sets. This is a difficult question to answer because it is largely a matter of opinion. The first step in deciding who makes the best cookware sets is to know what your preferences are. Cookware is made in a variety of styles and materials. It is helpful to know what each can and can't do. It is also a good idea to define your cooking needs because it can narrow down your cookware selection even more. Finally, you need to decide how much you can afford to spend because some cookware can be very expensive. Good cookware is an investment. It is an investment not only financially but also in your cooking skills. There is a variety of materials used for cookware and each has its own pros and cons. Which is best for you will depend on the amount of time you spend cooking, the types of foods that you usually cook, and the amount of food that you cook. Copper is an excellent choice because it conducts heat evenly. This means there are no hot spots in your food to cause scorching or curdling. It not only conducts heat evenly, it conducts it well. Your food will reach the desired temperature very quickly. Copper cookware is the choice of many chefs. However, copper is reactive. It can react with certain foods as you cook them and change the color of the food. Because of this most copper cookware is lined with a layer of stainless steel. This keeps the food from changing color and still gives some of the benefit of copper. The problem is that stainless steel is not a good conductor of heat and by lining a pan with it, the natural conductivity of the copper is greatly diminished. Pure copper will also scratch easily and discolor so it may not always be the pretty copper color it is at first. Aluminum is an inexpensive material and it conducts heat very well. Like copper, however, it is reactive and can change the colors and even the flavors of certain foods.Some manufactures have overcome this by using anodized, aluminum for their cookware sets. This type of cookware is treated with chemicals to prevent it from reacting with acidic foods like tomatoes. This type of aluminum cookware is chemically treated to prevent it from reacting with acidic foods. Once aluminum is anodized it cannot be put in the dishwasher. 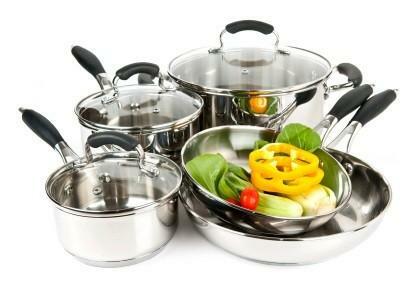 Stainless steel is one of the most durable materials for cookware that you can get. It doesn't react with foods and will not change the flavors or colors. The more high quality the stainless steel the better performance the cook will get from the cookware.As has been previously mentioned, stainless steel is a poor conductor of heat. It can be scorched, or have food stick to it. The best qualities of stainless are quite expensive. Some cast iron cookware is enameled while other cast iron is not.Bare cast iron is a superior heat conductor although it does take quite awhile to heat up. Once it is seasoned, it is largely nonstick and very easy to clean. Another benefit is that cast iron is nearly indestructible. Cooking with cast iron will cause iron to leach into your foods in small amounts helping keep your blood iron levels healthy. However, it is very heavy and can rust if it is not dried quickly. Enameled cast iron will not rust and there is no need to season your cast iron cookware before using. It is easier to clean and the enamel is usually very colorful and beautiful. However, enameled cast iron does not have some of the benefits of the bare cast iron. It does not withstand extremely high heat well and will not resist sticking. Iron won't be leached into the food. Who Makes the Best Cookware Sets Overall? Generally, the same manufacturers make more than one type of cookware. The standard of quality rests with the manufacturer rather than the set itself. Le Creuset has been around for decades and some of their cookware made in the early 19th century is still being used in kitchens today, a tribute to the durability of their product. While they have traditionally only made enameled cast iron they now make 3-ply stainless steel as well. While these brands of cookware may be expensive, they have proven their durability over the years and consistently get good reviews from consumers. Recently many celebrity chefs are coming out with their own cookware that tends to be moderately priced and good quality. It is important to consider the materials before choosing the cookware.